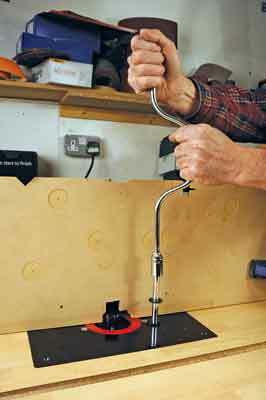 Recently, my colleague, Furniture & Cabinetmaking Editor Derek Jones, observed that my favourite home-made router table had no means of quickly raising and lowering the router. It has a Trend insert plate and a big Trend T11 router that stays permanently mounted underneath. 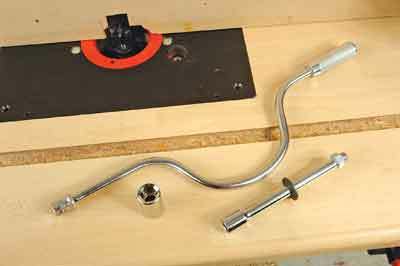 Naturally, I use their fine height adjuster through the hole I drilled in the insert plate, as per the instructions. This works well enough but it is very slow, so being determined to find an answer, I came up with the rapid router raiser. Trend - here is your next product idea! 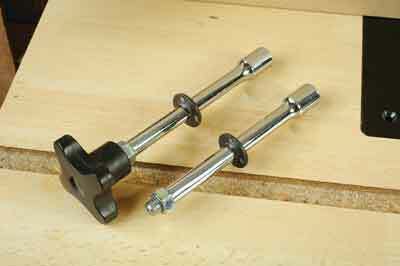 The standard fine height adjuster works well, but it's slow and the knob often clashes with the high sub-fences that I usually favour. 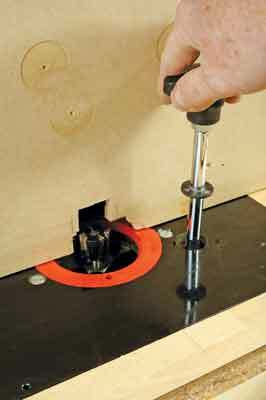 The first job is to undo the nut below the knob and then undo the knob itself, which isn't easy of course, because it was never intended to be removed. We have a well-equipped, but cheap socket set in the GMC workshop so I decided to purloin a 14mm socket and socket brace. The socket sits easily over the fine height adjuster nut, which I secured in place with CA adhesive. The brace now makes adjustment quick and is high enough to clear a high fence!